These Aluminum 'bushings' replace OEM, rubber, poly, or any other material currently in the location of the main sub-frame bushings on E30 chassis. Aluminum will not deflect under any load making it ideal for vehicles that want absolute maximum performance on the track. The solid nature of these bushings turn the massive subframe into a load bearing member, increasing chassis stiffness leading to improved rear end control and feedback. 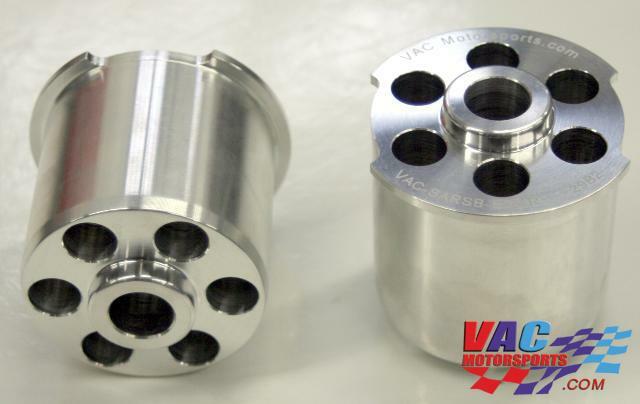 These may be used on a street car but they will transmit more "NVH" or "noise, vibration, and harshness" through the chassis than OEM rubber bushings.